Surface brightness fluctuation measurement capabilities of LSST. The other prominent members of the low surface brightness world are dwarf galaxies. Low luminosity galaxies are the most numerous galaxies in the Universe, and are interesting objects for several reasons. They tend to have had the least star formation per unit mass of any systems, making them interestingly pristine tests of small-scale cosmology. For the same reason, they are important testbeds for galaxy formation: Why is their star formation so inefficient? Does the molecular cloud model ofstar formation break down in these systems? Do outflows get driven from such galaxies? Does reionization photo-evaporate gas in the smallest dwarfs? However, dwarf galaxies also tend to be the galaxies of lowest surface brightness. For this reason, discovery of the faintest known galaxies has been limited to the Local Group, where they can be detected in resolved stellar counts. Here we discuss the discovery of such objects in diffuse light at larger distances. We know that for larger galaxies, the effects of environment are substantial — red galaxies are preferentially foud in dense environments. Thus, we need to study dwarfs in environments beyond the Local Group. Questions about the importance of reionization relative to ram pressure and tidal stripping hinge crucially on the field dwarf population — and extremely deep, wide-field surveys are the only way to find these galaxies, especially if reionization has removed their gas. 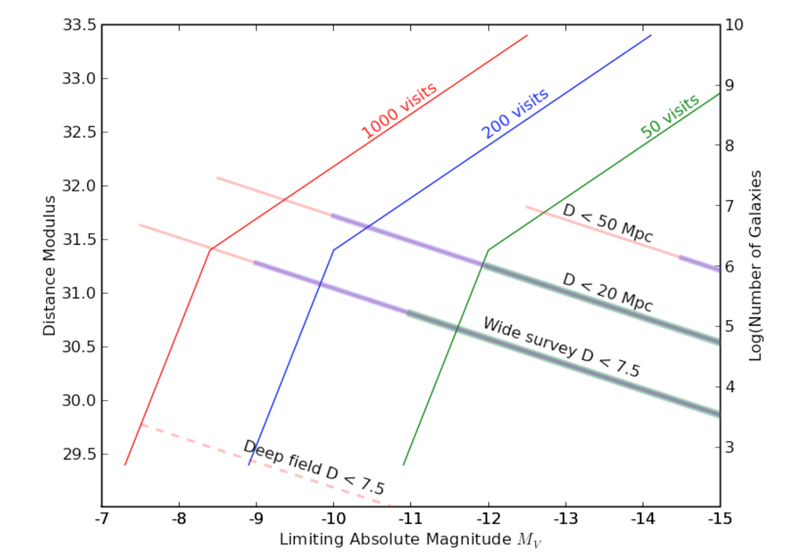 Based on the early-type galaxy luminosity function of Croton et al. (2005), with a faint-end slope alpha = −0.65, we can expect 105 early-type dwarfs brighter than MV = −14 within 64 Mpc. Such galaxies will be relatively easy to find within this distance. Pushing to lower luminosities, the same luminosity function predicts ~ 103 dwarf spheroidal galaxies at D < 10 Mpc brighter than MV = −10. However, we have no business extrapolating this luminosity function to such low luminosities. Using the same M and , but changing the slope to = −1, changes the prediction to ~ 105 galaxies. Clearly, probing to such low luminosities over large areas of the sky will provide a lot of leverage for determining the true faint end slope and its dependence on environment. Spectroscopy may not be the most efficient way to confirm that these are actually nearby dwarf galaxies. At MV = −10, the surface brightnesses are generally too low for most spectrographs. However, many will be well enough resolved to measure surface-brightness fluctuations (see Figure). Followup observations with HST, JWST, or JDEM can resolve the nearby galaxies into individual stars, confirming their identification and measuring distances from the tip of the red-giant branch.